NBA – The newly crown 2017 NBA Champion Golden State Warriors handed the 5th NBA Finals loss to 3 time NBA Champion LeBron James that drops him to career NBA Finals record of 3 Championships and 5 losses. The loss was the 2nd NBA Finals loss of LeBron James to the Warriors in their 3rd consecutive Championship meetings. LeBron James is no doubt the greatest player of today’s basketball, he is the barometer of any teams in the NBA that looks upon him on how to defeat this guy? James made a bad team into championship caliber like what he did in his first year comeback in the Cavs uniform when he led the Cavs in the NBA Finals. He has been in the NBA Finals for the 7th consecutive time the most for any player of today’s era and more likely again this coming 2017 – 2018 NBA Season. He led the Cavaliers in their first ever NBA Championship in franchise history after defeating the 73 – 9, Golden State Warriors in a classic down to wire Game 7 in Oakland in 2016. The win cemented his legacy in basketball and all he have to do is to enhance his legacy as the year goes by and chase the ghost the he is referring to Greatest of All Time (GOAT) Michael Jordan? But Kevin Durant and the Warriors are in his way and blocking the road to supremacy. The Golden State Warriors added former Oklahoma City Thunder and former MVP Kevin Durant during the 2016 NBA Free Agency to join forces with 2 time MVP Stephen Curry, former Defensive Player of the Year Draymond Green and all-star Klay Thompson to form a super team that could beat LeBron James and the Cavaliers. That move went successfully after regaining the 2017 NBA Title on June 12, 2017 after defeating the Cavs in Game 5 at home in Oracle Arena in Oakland. 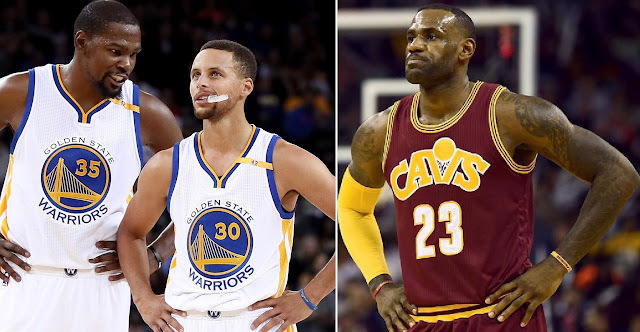 The 2017 NBA Championship of the Warriors over the Cavs in their 3rd meeting ruin’s LeBron James legacy temporarily in chasing the ”Ghost” Michael Jordan for the Greatest of All-time when it comes to NBA Championship? But individual stats James is still there, after adding another milestone in his career stats as he became the first player to average a triple double in the recent NBA Finals. For now, James and the Cavaliers must find a way to defeat the Warriors in the Finals? If they happen to face again for the 4th time? And if not? LeBron James will never again came close to any discussion of who’s really the GOAT and will never compared to Michael Jordan. No Comment to " The Warriors are the only Obstacle in LeBron James Legacy "